Zetsche, left, and Ghosn will not have a joint press conference to discuss their alliance with reporters this year. The "Carlos and Dieter Show" will not take place this year at the Frankfurt auto show, which could be a sign of trouble. 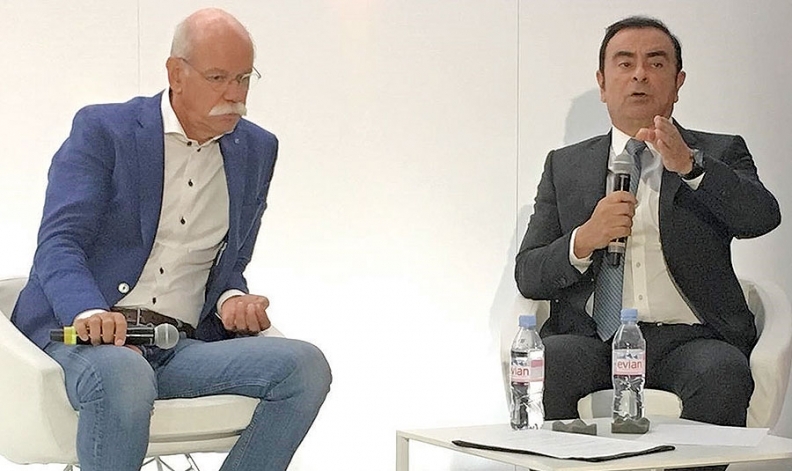 Hearing Renault-Nissan CEO Carlos Ghosn and Daimler CEO Dieter Zetsche update the progress of their strategic alliance has been a highlight of Europe's big autumn car show since 2011. Whether the show took place in Paris or Frankfurt, you could count on Ghosn and Zetsche's news conference to be a highlight of the second press day because the CEOs would usually announce another big joint project. That won't be the case this year. Officials blame the cancellation on Ghosn's schedule. He won't be in Frankfurt. However, his absence raises some eyebrows, even if the debut of Nissan-based Mercedes-Benz X-class pickup highlights the most recent result of the alliance. Fair enough. Not all ideas pan out and there's certainly no point in pursuing a new project just to maintain a facade. Nevertheless, it was already hard not to question whether the momentum has been lost, possibly because of Ghosn's takeover of Mitsubishi, which was part of Daimler's empire more than a decade ago, but only caused Stuttgart execs major headaches. The Mitsubishi deal may have changed Ghosn's priorities, diminishing Daimler's role in his long-term plans. That's how it appears now that the CEOs no longer have time any more for their annual ritual.